Marion Meadows understands it perfectly to put himself in the limelight. So that the light does not blind him, you can see him on many of his covers with sunglasses. This underlines the aura of mystery, created and wisely cultivated by him. Musician friends and fans know him however as a sociable person who likes to have a small talk. Keeping soul in mind his new album is titled Soul City (2018). 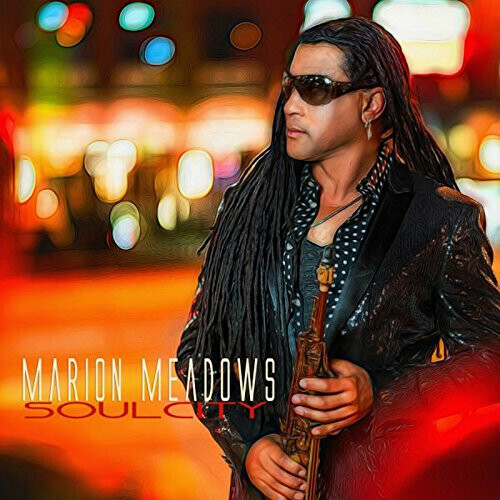 Marion performs on this album mostly soprano sax, on several tracks tenor sax. He reached out to two familiar producers and keyboardists, who designed the album with him. We talk about Chris Big Dog Davis and Rahni Song. Marion also invited prolific guest musicians such as Will Gaines, Julio Hernandez (bass), Norman Brown, Peter White, Rohn Lawrence, Wayne Gerard, Kaimi Hananoeau (guitar), Joey Sommerville (trumpet), Maysa, Peabo Bryson, Kim Fleming, Will Downing, Dana Lauren (vocals), Maria Meadows, The Super Choir of Atlanta, Timmy Maia (bg. vocals), Roberto Vazquez (piano), Orlando Hernandez (drums, percussion), Jeff Bradshaw (trombone), Jorel “Jfly” Flynn (drums), Justin Gilbert (keyboards), Nicole Neely String Chicks Music LLC (strings), Bob Baldwin (string edits), Niger Troutman (Timpani).